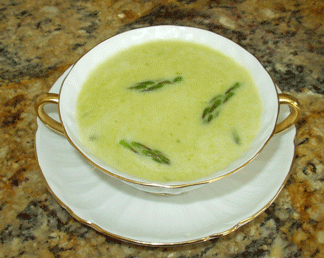 I have enjoyed making this cream of asparagus soup to celebrate spring for more years than I care to remember. My dog-eared, stained recipe was banged out on the typewriter at my first job after college. There have been a few changes made over time and I remember being so happy to finally have easy access to shallots (a long time ago as well). Nowadays, I make my own chicken stock, another early cooking goal. 1. Heat stock to boiling. Trim and peel asparagus. Discard stalk ends. Cut the stalks into 3/4 inch pieces and set aside. Drop tips into boiling stock for two minutes, then set aside. Pour stock into large bowl. 2. Heat 6 tablespoons butter in a large heavy-bottomed pot or ‘Dutch oven’. Add the flour and stir for 2 minutes or so. Gradually whisk in the hot stock until smooth. Continue whisking until mixture has thickened. Cook for another 5 minutes on low heat while you go on to sauté the stalk-shallot mixture. 3. Heat remaining 2 tablespoons of butter in a large skillet. Once the foam reduces, add stalk pieces and shallots. Add a little salt and pepper to taste. Cook for 5 minutes, then add to simmering soup base. Cook over medium-low heat, just until asparagus in tender. 4. Purée soup in batches in a blender; return to Dutch oven. 5. Combine the egg yolks with the cream in a small bowl and gradually add the puréed soup until the egg-cream mixture is warmed. Add the egg-cream mixture to the soup, bring to a low boil and cook, stirring, for 2 minutes, also adding the reserved tips. Correct seasoning and serve.